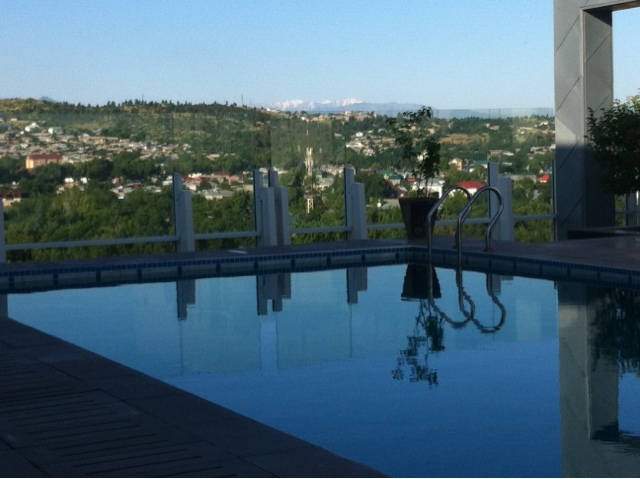 If you look hard you can see the Pamir Mountains from the rooftop pool on the 9th Floor of our hotel. A good time and place to look back at a month of traveling and the last week in the 'Stans. Central Asia for all the border hassle and bad roads has been everything you would expect. A crossroads of cultures between Persia and the Steppe and between the edge of Christian Europe and the western border of China. The land of empires and of the Silk Road trade that made the cities such attractive targets for plundering armies. The patchwork of states created by Stalin and preserved after the break up of the USSR does not quite match the ethnicity of the population. There are Uzbeks in Tajikistan and Turkmen in Uzbekistan. The countries do feel different though. Turkmenistan seems more uniform and less spontaneous (perhaps it's the desert or the regime?). Uzbekistan more free rolling (the influence of the Silk Road?). Dushanbe (which is all we have seen of Turkmenistan so far) more Russian and more Mountainous. The Silk Road cities were stunning. A riot of blue faience. Monuments to Islam and the emperors who built them. Khiva shone through. Compact and coherent within its walls it captured the imagination in the way the set pieces of Bukhara and Samarkand didn't. It seems a lifetime ago that we left the Ace Cafe. The rhythm of travel blurs towns and roads into a stream of experience. It is starting to be hard to remember every overnight stop, let alone each view, each sight, each encounter. The overwhelming impression is of roadworks. It is as if all the yellow machines in the world have descended on our route and dug it up. One day their work will open these countries up to the trade and tourism that they need to develop. Then the Silk Road will flow with the riches of the world once more and everyone will be able to visit the spectacular sites and meet the warm people of the region. In the meantime, it makes for interesting riding. As we look to the Pamir Mountains the group is strong and supportive. There is a feeling of excitement and a determination to make it to the other side together. As Kevin says, few motorcyclists have ever ridden across the Pamirs. We are privileged and mean to make the most of it. Great to read today's reflections, enjoy yourselves & the experience, you're almost half way through your trip...not that I'm counting the days! Have fun!